David Hurt starts his day just after sunrise with a cup of coffee, a pair of binoculars, and a copy of The Sibley Guide to Birds, before the clamor of kids and the hustle to school and work, in a room set up expressly for watching birds. 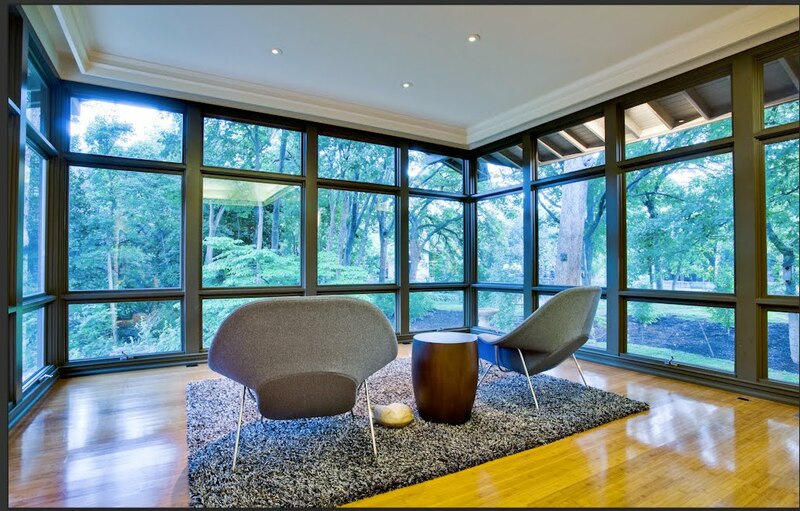 Glassed-in on three sides and austerely furnished with a pair of vintage Eero Saarinen Womb chairs, the room cantilevers over the 1.16 acre lot, which ambles 20 feet down to one of two creeks on the property. Thirteen bird feeders are placed strategically within view of the room, and a bright row of native turk's cap makes a crimson slash under the windows, attracting ruby throated hummingbirds and butterflies. “It’s bird watching paradise. I can’t wait to get up and look at what’s going on outside that room every morning,” says Hurt, 42, who started watching birds when he was in elementary school. He and his wife Kim, 41, own Wild Birds Unlimited, a store on Lovers Lane devoted to bird watching enthusiasts, which they opened in 1993. They’re also the founders of Dogwood Canyon Audubon Center, a 290-acre plant and wildlife habitat in Cedar Hill, which will open this spring. 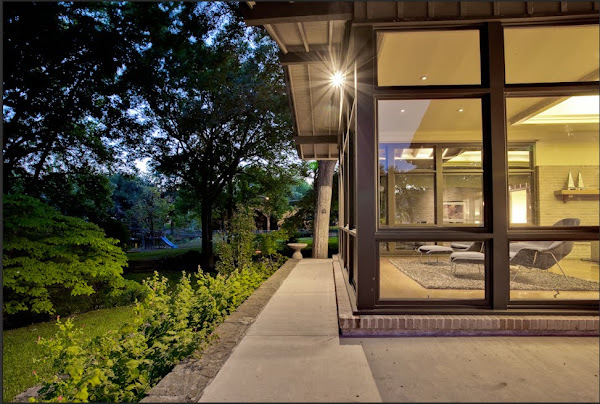 Their bird watching room, as it’s sometimes referred to, is the focal point of this two-story 5,000 square ft. modernist house on Alexander Way near White Rock Lake that Hurt’s aunt and uncle built in 1965. The Hurts bought the house in 2002, and renovated it five years ago. They added a fourth bedroom, opened up the kitchen, repainted with low VOC paint inside, laid sustainable bamboo flooring, and improved the house’s energy efficiency with additional insulation and Energy Star appliances, an EPA-approved designation for products that meet the government’s energy efficiency requirements. Their annual total energy bill averages a mere $1,200. With deep overhangs and exposed cedar beams, the house has a muscular, Arts and Crafts feel. Listen to the golden-cheeked warbler here. For the Hurt’s children, Ben 11, and Brynne 4 1/2, the yard is their own private nature preserve. They fish for perch in the creeks, and watch snapping turtles and wood ducks come up from the water to lay their eggs and raise their young. “This is the first generation of children in our country who don’t have a real connection to nature. They’ve spent all their time in front of computers and parents are afraid to let their children play outside,” says Hurt, who donated 40 acres of their own land in Cedar HIll to start Dogwood Canyon Audubon Center, in part to help other children experience nature like theirs have. The Hurts have spent the past eight years raising $7.4 million to buy another 210 acres. A 7,000 square ft. visitor’s center with classrooms, designed by Cunningham Architects, will be operated by the National Audubon Society. 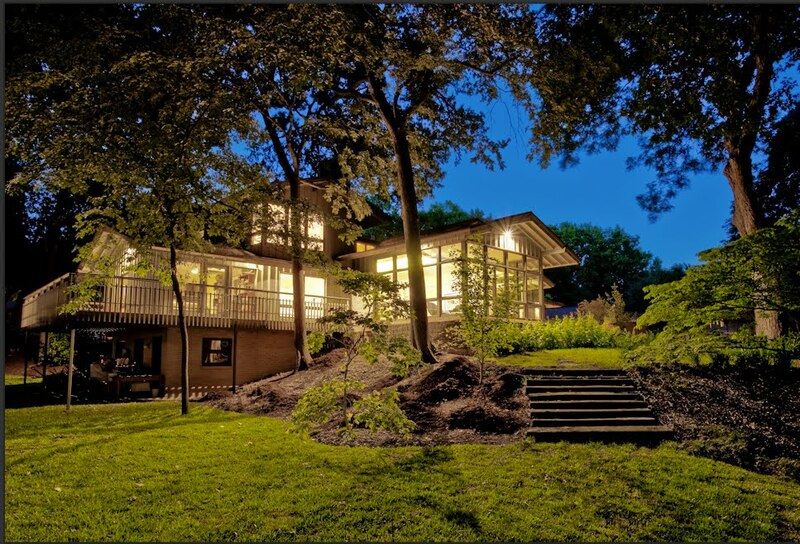 Glowing like lantern at dusk, the house is perched atop a knoll that rolls 20 ft. down into creeks. A mini nature preserve in the heart of Lakewood, there are 70s kinds of native trees and more than 135 species of birds have been spotted in the Hurt's yard. In September, spurred in part by an “ah-ha” moment while sitting in the carpool line, the Hurts put their house on the market. Says Hurt: “One of the cars in front of us had a bumper sticker that said, ‘You need to be the change that you envision.’ We realized we weren’t living like we think. We want to live a lot smaller, with a smaller carbon footprint, and this house is a lot to take care of. We don’t want all of our resources going to this house, as much as we love it. We’d like to give back to the community. Think of how many kids we could send to summer camp on the $18,000 a year in taxes it costs for this house?” The house at 7008 Alexander Way is listed for $1.29 million through Kim Gromatzky at Ellen Terry Realtors. Go here to see photos and details. My original story appears in the current issue of Modern Luxury magazine, here. Turn to page 60.